In 2007 I decided to replace a whole slew of ancient Internet servers (~700W) with one energy-efficient laptop (~30W) to save electricity and maintenance effort. The system was intended to be efficient enough to power purely from solar PV for most of the year. Though just avoiding wasted energy is the major driver. 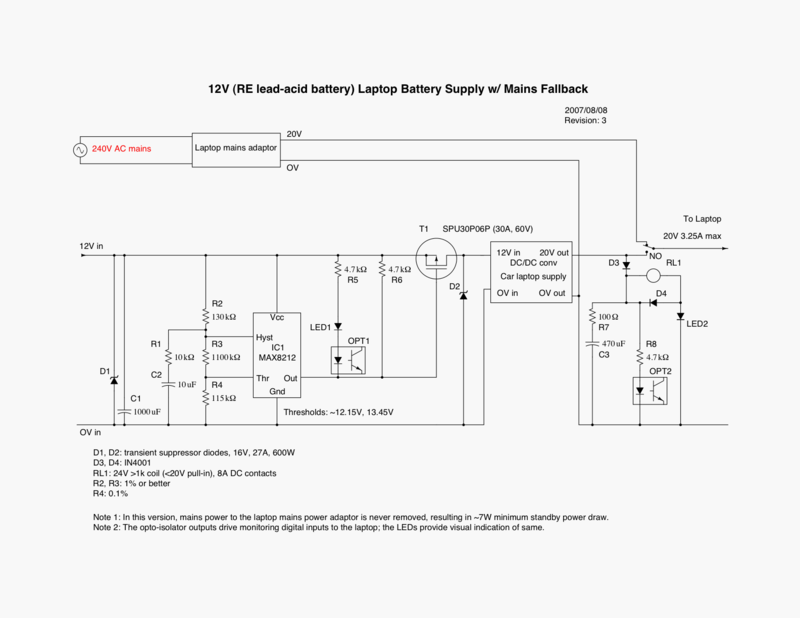 A typical modern long-battery-life laptop can operate comfortably on 30W or so. Up to maybe twice that on heavy load with all the bells and whistles blasting! My aim here is to have a machine that I can tune even further. Possibly 20W or less absolute minimum base load to support all services, getting the applications to be able to run on less juice when on battery power. For when the sun isn't actually out and the batteries are not fully charged, when running on solar PV. A basic Web server (Apache). A Java-based Web server (Tomcat). NTP (Network Time Server) public time server. Some compilations, heavy research computations, and housekeeping activities: these are able be deferred in large part if battery power is low. All my applications would run on almost any modern laptop operating system, eg Mac OS X, Linux, Solaris, Windows XP. I don't trust Windows from a security or stability point of view after long experience. All my existing servers are Linux or Solaris, ie a UNIX variant, and they can run for months without intervention from me. UNIX also has the ability to plug in power-management software reasonably easily. Though in practice Linux probably has the biggest tech-savvy power-wise laptop user base! Linux comes with some tools such as laptop-mode these days. On a moderately-efficient laptop with the screen off, and disc activity minimised (or some FLASH/NVRAM cache) to allow spin-down, 25W or less base load from 12V DC seems entirely attainable. An SMTP mail server fending off 10s of thousands of SPAMs per day, and HTTP Web servers handling lots of requests, will both at least likely need their logging minimised or batched for example. 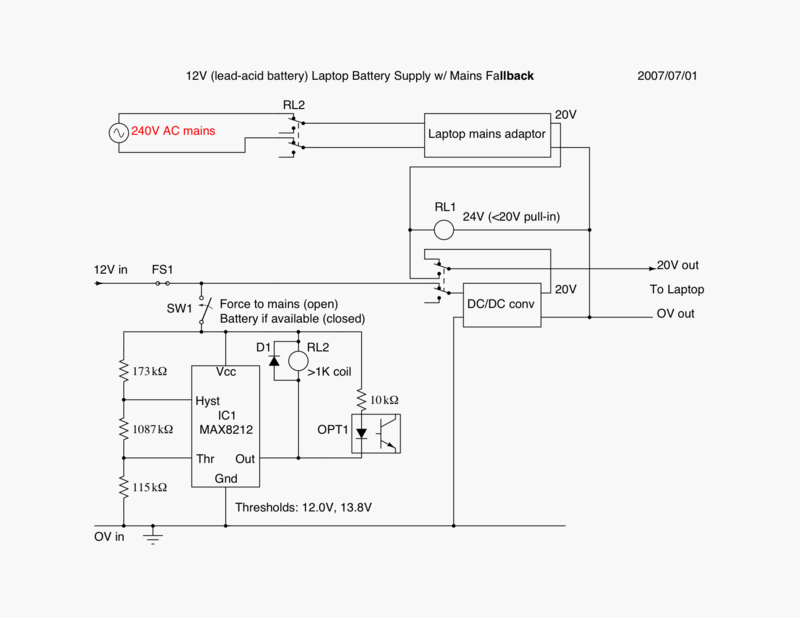 There exist reasonably efficient and cheap 12V DC automotive/car laptop power adaptors that I can use to power the laptop from my 12V DC solar PV system when I have adequate power available. Use the 'ondemand' CPU-speed governor. Have no swap configured to minimise disc I/O, or have minimal 'swappiness' eg with echo 1 > /proc/sys/vm/swappiness or add to /etc/sysctl.conf the line vm.swappiness = 1 for the next boot. Use of tmpfs for /tmp (and /var/run?) to minimise disc I/O. Mount filesystems noatime (or ro) where possible to reduce I/O. Tune apps such as syslogd and Apache to log more efficiently. Boot/run OS from SD memory card to avoid disc access. Use of laptop-mode tools to enable disc spin-down. Avoid running any unnecessary services/applications. Disable some (public) services when very short of power. Turn the screen (backlight) off whenever possible, eg by keeping the lid down. I also need to ensure that the system shuts down safely when battery does run out to avoid losing or corrupting data. ~20:1 ratio of PV Wp rating to equipment power for winter coverage, ie ~500W. As little as ~125W might provide full summer-time power. These figures line up reasonably well with earlier estimates. I'm seriously considering a very small wind-turbine as a top-up in winter. The 4:1 summer:winter insolation ratio otherwise makes for a horribly expensive (or less-useful, summer-only) system. 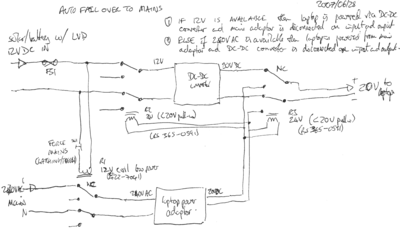 Update 2007/06/28: I have sketched a circuit that could allow the laptop to run on 12V solar power whenever it is available, and falls back to mains power otherwise. This allows us to make maximum use of solar power, and draws no power from the mains when on solar. 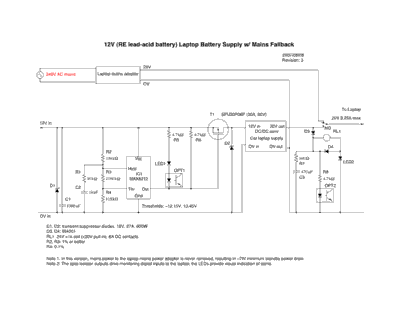 This design assumes that there is a LVD (Low-Voltage Disconnect) controller upstream that will protect the battery when its voltage drops too far. And further that this will not oscillate on and off rapidly when the battery is in a marginal state. Update 2007/07/01: I bought a (ready-assembled) Velleman K8055 USB interface card from Maplin and tested it quickly with a free UI for my MacBook. 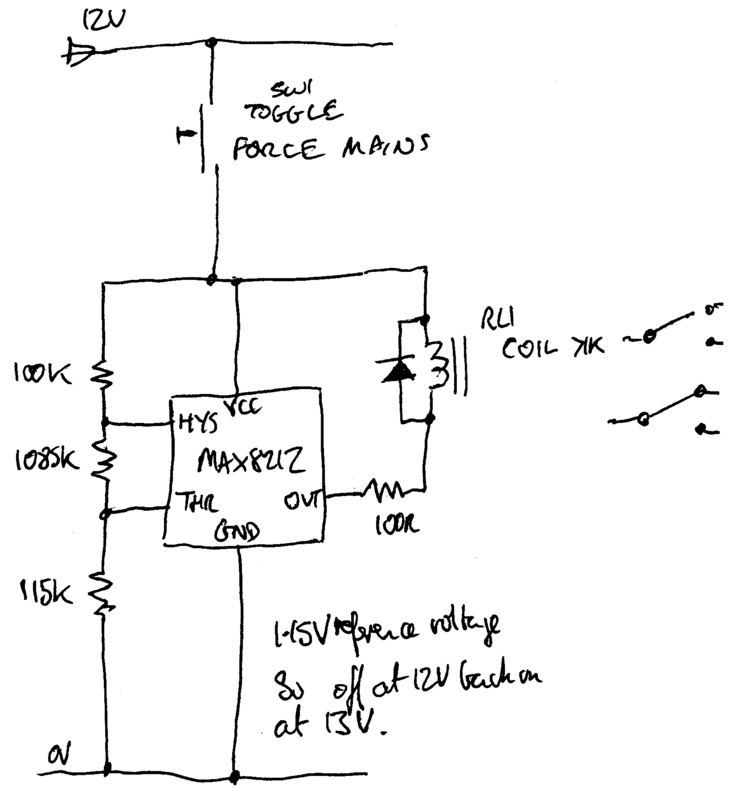 Update 2007/07/02: Simplified design with just two relays. Also adjusted battery thresholds of 12V to disconnect from the battery and 13.8V before reconnect. That should mean that the battery is being charged and is nearly fully charged. See the XCircuit .ps file. Update 2007/07/04: Having now been able to observe the resting/unloaded voltage of my 12V SLA accurately with my E-flite power meter I think that I going to have to bring the upper threshold (to reconnect the laptop to the batteries) under 13V or we may never get reconnection. I'll simply have to see how stable that proves, or if it is prone to oscillation as the laptop load is removed from the 12V supply. The laptop LVD should be higher than that of my lighting, to ensure that we don't get any unnecessary lights-out without warning. Update 2007/07/08: 'Gutsy' tickless kernel, laptop-mode and cpufreqd running: power consumption from mains ~27W. Update 2007/07/09: NTPD (without local radio clock) and mirror of Gallery (Java Web app) running. Power still ~27W from mains. Update 2007/07/09: k8055 USB board and executable now working, so I can have my battery-state sensor inputs. Update 2007/07/11: Tested Vanson SDR-120W to power the laptop from the 12V battery. It works fine and uses about 21W which is about 5W less than the mains adaptor draws to power the same workload. Unfortunately, even with no load, the Vanson trips the overload/short detector on the SHS-6, and so cannot be driven by it as things stand. 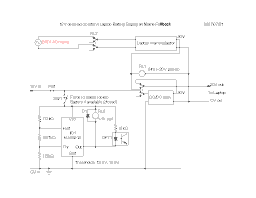 I will probably have to build my own low-voltage disconnect (LVD) circuit and draw power directly from the battery. I think that I'll have the secondary 'battery OK' threshold set at ~12.5V with a small hysteresis (maybe 0.1V) for the laptop to decide when it can run power-intensive tasks. Else this many not happen each day, even with plentiful sunshine. In any case, it should be significantly above the LVD for the laptop and lighting so as to leave plenty of reserve for overnight and overcast days. Update 2007/07/20: The old servers have been off since this morning as a kind of a test. Though I don't have all services (eg mail) working on the new server yet. The study is about 6°C cooler than before and quiet enough that for the first time I can hear the Linux laptop's fan! So I've been tweaking the cpufreqd settings a little to see if I can keep the fan off all or most of the time to save a little wear and noise and power. (Temperature below about 51°C or 30% of maximum in cpufreqd terms.) When the CPU fan is off and the hard disc spun down there are no moving parts! Update 2007/07/23: The old servers are now off. Permanently I hope, except to access files for archiving and a couple of other small jobs. Components to build LVD circuit for laptop DC/DC converter should arrive today. Update 2007/08/06: Still getting some oscillation/cycling when the battery voltage/SOC is marginal. So after adding a larger 10µF 'delay' capacitor to the voltage sensor, I today raised the upper 'switch-on' voltage threshold to about 13.45V. This should only be reachable if the battery is charging and at ~80% charged. The lower threshold is still at about 12.15V, ie with the battery discharging at an SOC of ~50%+ charged. I'm still getting a bit of cycling, maybe 2 or 3 on/off cycles, but much better. Update 2007/08/08: Switched on default gzip compression (mod-deflate) in my Apache Web server for text pages such as HTML with all default CPU/memory-friendly settings. (8kB buffer, default compression, ie not maximum.) Though compressing each page takes a tiny bit of CPU, it may take several times fewer packets to send thus reducing bandwidth. And network wakeups/interrupts which may save a little power too. Update 2007/08/08: Working on updated schematic (3) for auto on-grid/off-grid laptop supply: as PNG, XCircuit .ps. Update 2007/08/20: I'm having trouble with cpufreqd half-failing and refusing to come out of "On Demand Low" mode, so I'm working on a hand-crafted Java-based replacement for my purposes. With one CPU clamped down to minimum speed, the other given full range (and using the on-demand governor), and the 'sched_mc_power_savings' flag set to keep one core as idle as possible, power draw from internal batteries seems to be hovering at around 17W, which is excellent. A snapshot of the code is available as a BZIP2ed GNU-tar image. With jCPUFreqD, USB devices set to autosuspend, and a quietish system, system power from internal batteries is reported as ~17.5W (with a range of between about 16.8W and 18W). Also did kernel update to 2.6.22-9 in case that brought any power tweaks, but no effect seen so far. Power into DC-DC converter (car laptop power adaptor) powering the laptop measured at ~18.5W using my E-flite power meter (reading fluctuating between 18.1W and 19.2W once laptop internal battery was charged, but the meter reading granularity is ~1W given a minimum current unit of 100mA.) This implies that the DC-DC converter and all my power circuitry is consuming/wasting ~1W, in line with targets/expectations. Update 2007/08/26: Laptop was off-grid with solar PV for ~7.3hrs today! Update 2009/07/06: I've just ordered a SheevaPlug (512MB Flash, 512MB RAM, 1.2GHz ARM CPU, USB and Ethernet, running Linux, in a small 'wallwart' mains-plug package) with a view to getting my entire server down to under 10W, using external plug-in low-power extern HDD/SSD, I/O board and ADSL/WiFi, with the whole lot possibly powered from my off-grid PV system even in winter. (The plug arrived 2009/08/17 after a little prompting from me, and uses ~7W out of the box.) I've made an initial tweek to the the Gallery Web app so that it'll run comfortably within 256MB-ish, down from 1GB minimum, ie less than half of the physical memory. Mainly took all night thinking (and working on another aspect) and then about 10 lines of code... Now if only all applications could halve their resource requirements that easily. Actually I'd like something with a little bit of direct digital discrete I/O so I don't need to use my K8055 board, and either support for more SDHC or direct drive for an external low-power HDD or SSD for my ~160GB of bulk data, or another USB so I could plug both those peripherals in without a USB hub. I think that in principle I could bring one of those (SATA for example) out from the plug, and I don't think the Open RD client gives enough more to be worth the extra space and cost (and probably consumption). I'm hoping that Zero/Shark will give me decent Java performance on the ARM. I've verified which Linux build is most power-efficient due to being 'tickless'. See more of the SheevaPlug setup. The laptop used is a Lambda 320N sourced from XePhi (since defunct). It has a small screen, 1.73GHz Intel Dual Core CPU, 2GB RAM, 120GB hard drive, DVD-RW and WiFi. It is fitted out with a 4G SD memory card in the SD port, from which the machine can boot and run without waking the hard disc often. The aim is to minimise hard disc traffic and keep it spun down to save power. Adam of XePhi loaded Ubuntu (7.04: "Feisty Fawn") and configured it to boot from the 4GB SD card, and with the SD partitions shadowed on the hard disc. If the SD card 'wears out' I will be able to easily bring up the system and construct a new bootable SD card with dd one command. (Plus a fixup for the SD card filesystem UUIDs and boot order in /etc/fstab and /boot/grub/menu.list...) Adam also set up the machine as for a typical secure 'server' with most services shut down and most ports firewalled off. This is the state that I have any new dedicated Linux Web host handed over to me too. Adam gave me superb support by email long after delivery to get things working 'just right' with a new kernel and the power-saving stuff, etc, etc! A very useful tool is PowerTop from Intel, which helps spot which applications may be wasting CPU cycles and thus power. A Linux package called laptop-mode can tweak a number of aspects of a machine to reduce its power consumption, the main feature being its ability to spin-down and shut-down hard discs/drives that are idle, and tweaking various parts of Linux to make that happen much more often than it otherwise could. Laptop-mode is still active with external power (since it might be solar rather than mains) and with lid down. Laptop-mode remounts drives with noatime to minimise activity. Laptop-mode controls hard disc power-management settings. Laptop-mode controls hard disc write-cache settings. Laptop-mode does not control CPU frequency and/or throttling. Laptop-mode forces orderly shutdown when battery is exhausted. to /etc/rc.local to ensure that laptop-mode gets enabled automatically at boot. cat /proc/sys/vm/laptop_mode (should give a number different to 0). cat /sys/devices/system/cpu/cpu0/cpufreq/scaling_cur_freq to check the current cpu frequency. cat /sys/devices/system/cpu/cpu0/cpufreq/scaling_governor to check the currently used governor. These last two will only work where CPU clock-speed adjustment is available. The faster your CPU runs (ie the higher the clock frequency), the more power it uses. If you have a modern CPU that can lower the core voltage when you lower the clock speed, then you will use less energy overall to get a set amount of work done if you can use a lower clock speed. The more time you can leave the CPU sleeping, the lower its power consumption will be, especially in modern processors with high CPU/ACPI 'sleep states' of C2 or better (eg C3, C4). Since getting in and out of sleep states costs time and energy, the longer you can leave the CPU sleeping each time then the lower its power consumption will be, especially for the higher sleep states. Use of a Linux kernel-based CPU speed governor such as 'ondemand' will ramp up CPU speed quickly to get a job done as fast as possible so that the CPU can get back to sleep ASAP. Clock speed makes relatively little difference to the power consumption of a sleeping CPU (since probably less of it is being clocked). If you have multiple CPUs (eg in 'Core Duo' laptops or newer) then it may be possible to control the CPUs individually to maximise power savings. All CPUs using the ondemand governor. The sched_mc_power_savings flag set to 1 to try to keep as much work as possible on one core so that the other(s) can idle for longer. The ondemand/ignore_nice_load set to 1 for all CPUs (since I do spawn low-priority async threads here and there). The first CPU (cpu0) set to range between the lowest frequency and something about halfway up the available list. I hope that the scheduler will use this CPU first, and indeed handle interrupts on this by preference, but I have no control over this I think. All other CPUs pegged to minimum speed. The up_threshold set to ~85% (ie higher than usual) to postpone increasing CPU frequency until desperate! The sampling rate for the governor set as low as possible, ie using the badly named 'sampling_rate_max' value, to only move up when there is prolonged demand in conjunction with the above. The Java process itself samples system state relatively slowly (at most every 10s), and even more slowly when in power-conserving mode to avoid wasting power itself, and to be reluctant to rush back into non-conserving mode. When I go into my 'less conserving' mode I let all CPUs range over all available speeds and push the up_threshold down to ~75% to be more eager to spring in to action. I also set CPU-usage sampling to be as fast as possible ('sampling_rate_min') to be as eager as possible again to ramp up performance when needed. When the battery voltage is reasonably high the laptop is taken off-grid: ~20W. When the battery voltage gets even higher, the laptop does all sorts of extra optional work (such as computations for my AI project): another ~30W. For stability I have discovered that it is wise to slowly ramp up consumption. Start by raising maximum CPU clock, then slowly add more load to the CPUs, etc, etc, over a matter of several minutes. Then back off very quickly to a minimal draw (a la TCP slow-start) if any of the sensors suggest that battery voltage is dropping. If it ever looks like that will not be enough then we can tune the software workload to use 100% CPU since the laptop maximum consumption is ~60W. 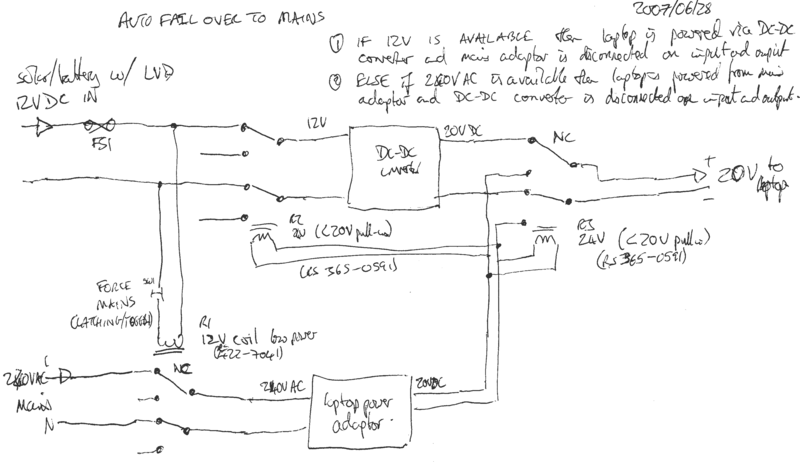 Note that I can probably also power my new ZyXEL ADSL modem (as of 2008/06) directly from 12V DC if required. Thus I'm using the Net as a software dump load for my RE system! Would like to be able to enable the 'HPET' timer in Linux to allow the CPU to sleep longer and thus eat less power when idle (ideally getting to the C3 or C4 sleep states). I think that a 'good battery' threshold of close to 12.5V should probably be used for the second sensor for the laptop software to start reducing power consumption. This probably represents a reasonable SOC (State Of Charge) >50% at rest or under light load, and is between the low and high thresholds for the auto-power-switchover circuitry. Heavy (read) access to the hard disc seems to consume an extra ~5W above base power draw. KernelTrap story July 2007 on Reducing Power Consumption. Notes on tuning power consumption for a laptop running Ubuntu Feisty Fawn (7.04). PowerTop from Intel, which helps spot power-hungry applications and devices, especially on laptops. LessWatts.org from Intel, which helps to trim power consumption on a wide range of Linux platforms. Since defunct http://www.xephi.co.uk/laptops/ XePhi for Linux laptops suitable for low-power running. Check your electrical power consumption with tools such as the Kill-a-Watt meter and those from Energy Optimizers Direct. The Linux Laptop Mode Tools site and its lm-profiler. See another Renewable Energy Laptop that runs off 12V DC. Velleman K8055 USB interface card (also sold by Maplin), and Linux drivers. XCircuit is a GPL (free) electronics cross-platform design package. Building a Linux Wireless AP (access point). An alternative to a low-power laptop for an end-user might be something like the CherryPal 2W PC that offloads some of its work to Internet servers, plus a power-efficient keyboard and LCD screen. 'Free' (if you don't mind giving away personal data) Windows PC power efficiency "Edison" tool from Verdiem to let you tune the existing power-saving settings (as of 2008/11). Caveats: download is big at 28MB and includes .NET 2.0, wouldn't install properly on my XP laptop other than for a user with full admin rights, Spybot Search&Destroy considered part of the install to be known 'malware' so I declined to run that part, the 'activation' process demanded personal details such as name and email and zipcode and I shall be looking closely for SPAM/junk having deselected all Verdiem's 'offers' especially as Hotmail classed even their activation email as junk. The fanless 6W--8W Intel Atom fit-PC2. Another low-power home server, with a VIA fanless motherboard: I'd like to be fanless, ie no moving parts and quieter, next time around. A Zero/Shark JVM on ARM may make for a very low-power server, especially if I can get some direct digital I/O for monitoring, USB for mass storage, 1GB+ of memory, and USB for bulk storage. An ARM-based netbook might be just right, or a plug computer (computing plug) at 5W or less excluding bulk storage and digital I/O... See more discussion at Fieldlines. Register article on monitoring and managing power consumption.